A long time ago, back in my boardgaming infancy, a friend of mine taught me the acclaimed card game Race for the Galaxy. I still to this day have no idea how that game is played. It was a long, confusing process to understand the rules, and by the time I started to have some sense of what was going on, I had lost. Now that I have significantly more board gaming experience I would like to go back and try Race for the Galaxy again, if only to prove to myself that I can, in fact, wrap my mind around it. In the meantime, I’m having a lot of fun with Race for the Galaxy’s lighter, dice-rolling brother: Roll for the Galaxy. Roll for the Galaxy has a lot of dice. I’m going to get that out of the way first. It contains over 100 multicolored, attractive (albeit small) dice. Sadly, the most dice you will roll at one time in any given game is about a dozen, but still, they look nice sitting on the table. 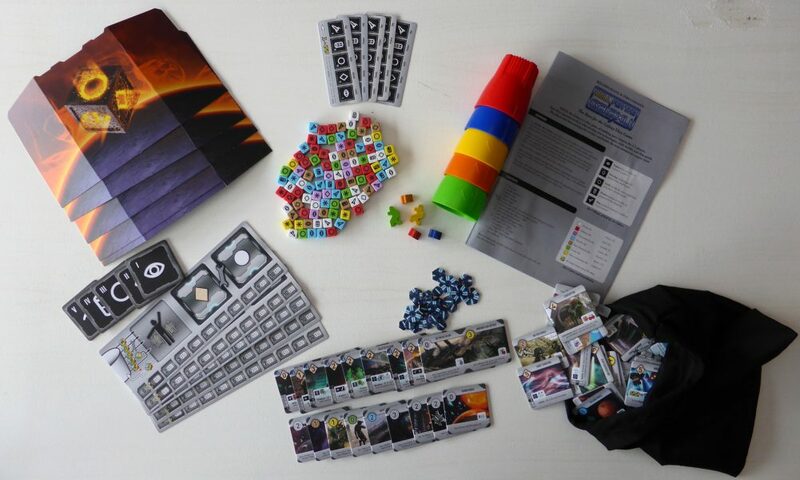 The other main component in the game are square cardboard tiles representing planets and developments that players may settle and….well, develop. Everyone also gets a small plastic cup to designed to make the act of rolling dice as loud as physically possible. Seriously, those cups are so loud. Each round, everyone will roll their dice behind a screen and allocate them to match the five different actions in the game. Each player must then “lock in” one of the actions. After everyone reveals their dice, only the actions that were collectively locked in by the group will be available for that round. This is one the best aspects of Roll for the Galaxy–it takes the action selection mechanism of Puerto Rico or Twilight Imperium and makes it hidden and simultaneous. If not for this, there would be almost no reason to look at the other player’s boards at all. At higher level play, being able to accurately predict the actions that other people will select is crucial to success. The actions themselves are fairly straightforward and fuel two engines that make up the primary strategies for the game. The first can be described as a build strategy, where the player is trying to settle and develop as many tiles as possible. The explore action allows players to discover new developments and settlements, or it allows the players to cash in their dice for money. Once you’ve explored a new tile, it goes into a stack in front of you and you must allocate dice to settle or develop to complete them. The second main strategy is a production strategy, where you use the produce action to convert your dice into goods, which are stored on settlements, and which can be shipped (the 5th and final action) for either money or victory points. The tiles have an adequate amount of variety, but nothing will blow your mind. Settlements only give you more dice. The developments are more interesting, and give you powers that can help you reallocate dice rolls you don’t like, boost a particular action in the game with added bonuses, or provide alternative means of getting victory points. When I say these are the two strategies in the game, I’m not oversimplifying. Building and producing/shipping are essentially the only way to get victory points. The special development tiles that grant victory points can give you a little bonus, but I haven’t seen any that might drive an entirely new strategy. Points are given out based on the cumulative cost of all of your completed settlements and developments, plus any victory points gained through shipping goods and through special development tiles. I would have liked to see a more broad selection of primary and secondary strategies available. As it stands, players will want to generally have an idea of which direction they’re going to go and commit to it fully. I am not convinced that there is a viable strategy somewhere in the middle, since all of the different colors of dice have different strengths and weaknesses. Red military dice, for instance, are great at settling and developing, but have no sides for production or shipping. The purple dice, on the other hand, cannot settle or develop. However, if you are going for a production-heavy strategy, you will need to settle a couple of worlds to produce onto and hopefully find a development or two that compliments your strategy. Settling on a primary strategy off the bat is also critical because you are given two special starter tiles at random to begin with. According to a strict reading of the rules these should be entirely random, but frankly, given how much of an engine building game this is that relies on momentum and doesn’t have any built-in catch up mechanisms, that’s a serious rules oversight. I will always give players two options of each and let them pick. However, in a truly baffling move by the publisher, the game only contains nine tiles of each type (a double settlement/development tile and an additional settlement), so this is not an option in a five player game. A two player game about to start. the three starter tiles are placed above, and the tiles under construction below them. The starter tiles also seem to be very unbalanced. There are a couple that are simply abysmal, and I can’t even conceive of a good strategy based around them. Conversely, there are a couple others that seem to be much better than the rest. If not given any choice, players could be rewarded or disadvantaged from the start just by the random distribution of these tiles. Building seems to be both the first order optimal strategy and consistently the best strategy in the game, which is problematic. Usually in an engine-building euro game like this it’s beneficial to pursue paths to victory that other players aren’t doing, because resources are limited and other players may block your progress. 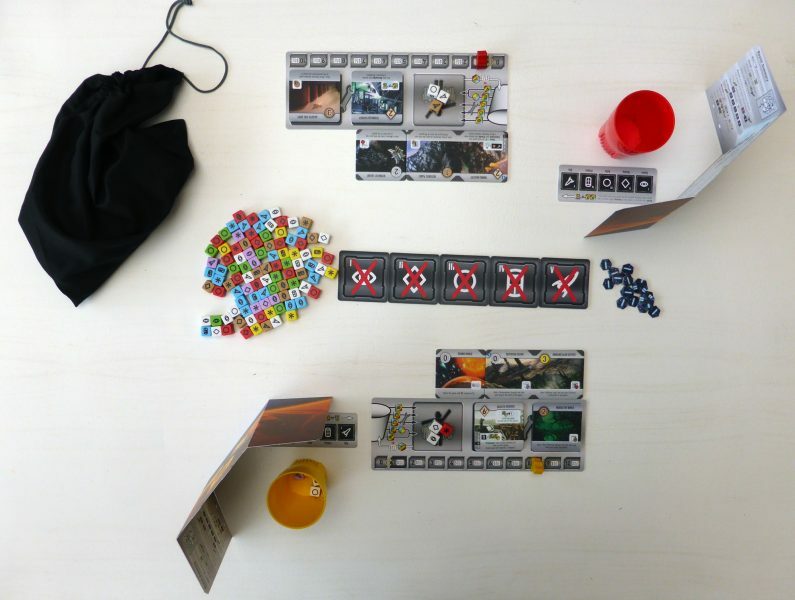 In Roll for the Galaxy, however, players who follow similar strategies speed each other up because of the action selection mechanism. If a single player is pursuing a production strategy, then they will need to spend one turn forcing the production action to happen, and then sell their goods on the following turn. If more than one player is following this strategy, then it is more likely that both the produce and ship actions will happen on any given turn, benefiting all of those players significantly. Additionally, because the game ends the round someone has placed their twelfth tile or the round that someone has grabbed the last victory point chit (the number of VP chits available scales linearly with player count), the players following similar strategies also get the advantage in deciding when the game ends, often leaving the odd player out in the dust. I don’t mean to sound overly harsh on the game. I do very much like Roll for the Galaxy. The experience for new players in their first 10-20 games will be figuring out these strategies and complexities that I have been discussing, and those games will be quite fun. In the long run, the more advanced play seems to be one of details–figuring out how to economize your decisions best and squeeze out marginal gains above your opponents, while reading the state of the game well enough to know how many rounds likely remain. This tactical play is enhanced by another one of my favorite parts of the game. The money you can earn through the explore and ship actions fund the return of dice to your cup. Every die, after it is used, must be bought back before you can roll with it again. While this may frustrate newer players who don’t like leaving any dice on the table, it becomes a very interesting tactical puzzle for the more experienced player as they try to weigh the costs of retrieving dice against other available actions. The result of a rush/build strategy–lots of red dice and not very much money with which to retrieve them. Ultimately, however, the biggest boon for Roll for the Galaxy is that it is delightfully quick. The box estimates a 45 minute playing time, but we are regularly able to complete games in under 30 minutes. Because nearly all actions are simultaneous, the length of the game also doesn’t increase very much as player count goes up. The short play time provides an incentive to experiment, which is sorely lacking in too many games. If you want to attempt a quirky line of play, go ahead! If it fails miserably, you can immediately start up another game and try something else. The short play time also makes up for the lack of any catch-up mechanisms. Halfway through a game of Roll for the Galaxy, a knowledgeable observer will be able to tell which players are still potentially in the running and which players are doomed to lose. But that’s fine if you’re only going to lose 10 minutes later. The game has a popcorn or potato chip quality where you can’t quite stop with one play. We’ve spent evenings playing this five or six times in a row. 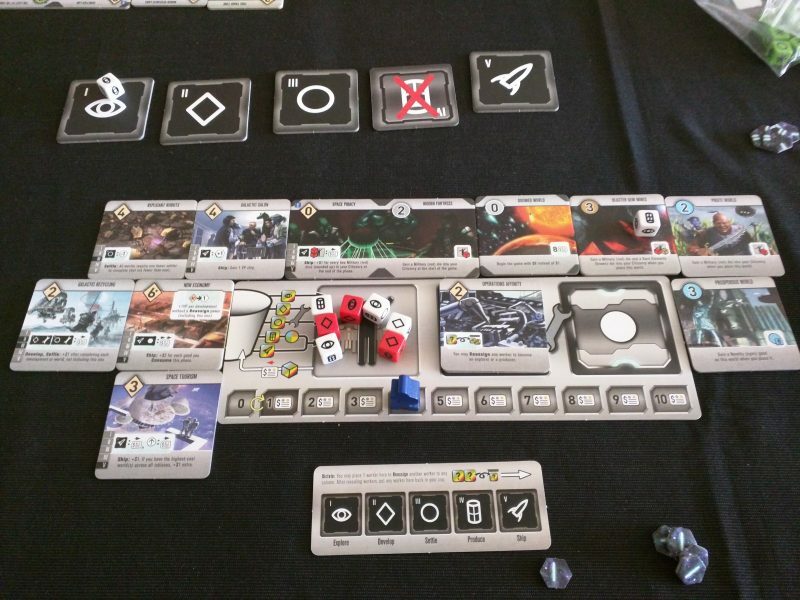 Roll for the Galaxy, despite its flaws, is a very fun game. Because of its higher level strategic decisions and its short play time, it’s probably better to think of it as a tactically rewarding quick/filler game rather than a short euro. If you play with the same people frequently, there’s the potential here for an interesting metagame to develop as everyone tries to outwit each other with starting tile action selections. One of the funniest moments in Roll for the Galaxy is when every player clearly needs one particular action to be selected, but it’s left absent because everyone was relying on someone else to choose it. Plus, there are over 100 candy-colored tiny dice you could claw up and emphatically roll at once. You know, just to try it. For fun. Please join the discussion below. Stay in touch by subscribing, joining our BoardGameGeek Guild, or by following The Thoughtful Gamer on facebook or twitter. Liked it? Take a second to support The Thoughtful Gamer on Patreon!